Buckle up. Technology is altering how ediscovery works. Learn what to expect and how to plan for the future. Technology is accelerating every day. Amid this rapid change, data sources relevant to ediscovery are literally crossing all facets of life — and there’s more on the way. How do in-house legal teams keep pace with this onslaught of emerging technology and update IT infrastructure to meet preservation demands? 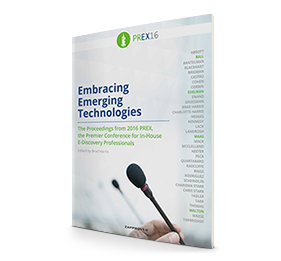 In the session “Embracing Emerging Technologies” at the 2016 PREX, the premier conference for in-house ediscovery professionals, panelists discussed emerging technology trends and how to prepare for these evolving realities. They reviewed exciting new technologies and shared tips on how to build a sustainable process. Craig Ball, Craig D. Ball, P.C. We’re here to help you build a platform for ediscovery mastery. If you need a hand or have questions, please contact us.